I had this for the first time when I was in 7th grade when I spent 2 months of summer vacation in Belgaum. I had such a gala time playing cards with cousins. I learnt lots of card games from my older cousins. This is a Belgaum/Belgavi special pohe dish. It is served with sugarcane juice. If you ask anyone from Belgaum about Alepak pohe and she start drooling. This recipe is my Ajji's she must have gotten it from one of the their regular vendors. It is very simple to make and can be ready in about 15-20 minutes. Clean, sieve pohe to remove any husk etc. Mix pohe, salt, sugar, lime juice and cilantro and peanuts. Sprinkle 1-2 tbsp water if needed. Set it aside for 15 minutes. 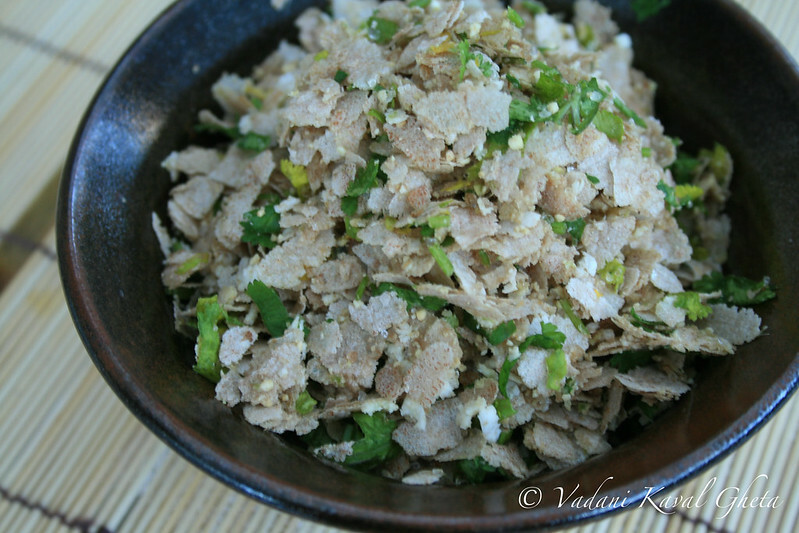 Grind phutane daale, ginger, green chilies, salt and sugar to fine powder. Make 4 small balls set aside. Mix remaining ground daale-chili paste in mixed pohe. Divide pohe in four equal parts. Serve with one ball of daale-chili ball. Enjoy it with fresh sugarcane juice if possible. I have used Kerala style Matta Pohe.